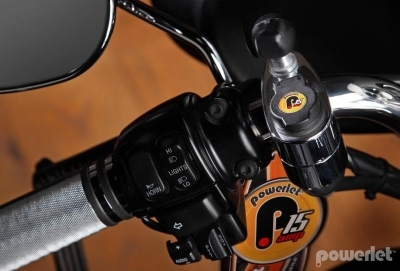 Our 7/8" To 1" Powerbar Plus provides a convenient outlet on any round handlebar or frame member. Simple bolt on solution provides a Powerlet® outlet for heated clothing, battery charging, powering Luggage Electrix™, inflating tires, etc. Works with PowerMount systems. Designed to provide both power and a mount, this patented system will provide quick deployment at every rest stop. Standard harness length is 54 inches, perfect to reach from the battery under the seat to the handlebar. Works with our PowerMount Systems. Our 90 Series Powerbar Plus Kits have been designed to work on all handlebars, including installation on the tapered section of the handlebar.